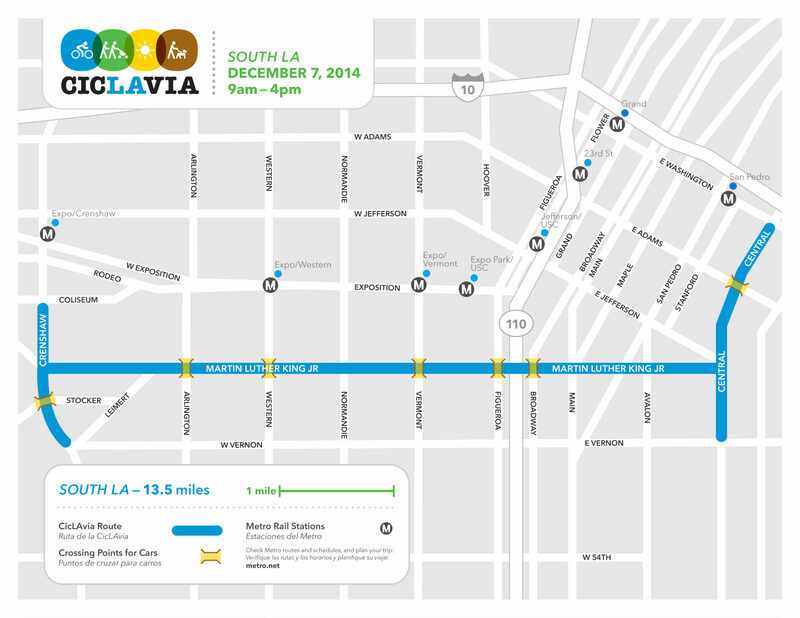 New routes were unveiled today for the next two CicLAvias. 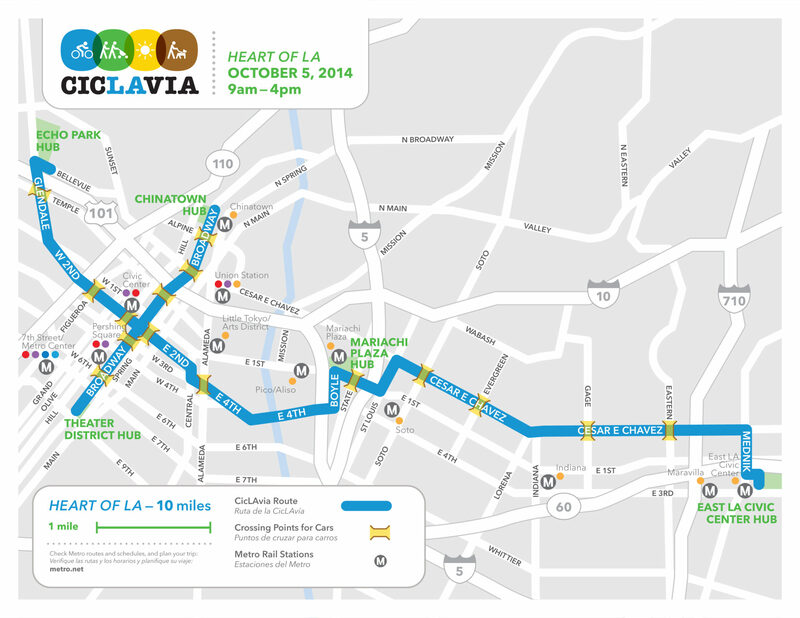 First up, if we can wait that long, is the Heart of LA route on Sunday, October 6th, extending from Echo Park, past Mariachi Plaza and into East LA along Cesar Chavez, with a second leg along Downtown’s newly pedestrian-friendly Broadway. Then Sunday, December 7th, CicLAvia comes to South LA for the first time, touring Martin Luther King Blvd between Central and Crenshaw, with forays along both iconic boulevards to visit vibrant Leimert Park and historic Central Ave, the birthplace of West Coast Jazz. April Morris sends word of a memorial ride for fallen Orange County cyclists John Colvin and Debra Deem this Sunday. On the morning of Sunday, July 20th we will take a short bike ride in the memory of John Colvin and Debra Deem. Remembering the Fallen. John was killed in June on a training ride in preparation for what would have been his first Ironman Triathlon later this summer. He was struck by a car on Pacific Coast Highway in Laguna Beach, California and succumbed to his injuries the same evening. Debra was killed last August on her daily ride from home to Corona del Mar. All are welcome to attend. We will meet at Heisler Park, (1 block west of PCH, on Cliff Dr. between Myrtle and Jasmine. ) in Laguna Beach. Meet at 8:00 AM. A short invocation will be given in memory of Debra and John at 8:15. Following the invocation we will ride north on Pacific Coast Highway toward Newport Coast Drive, retracing both Debra and John’s last ride. We will continue past the site of his death at Emerald Bay, turn off PCH at the site of Debra’s collision, and climb that hill for them. John would have likely finished each hill repeat at Pelican Hill Road, so we will call that the official “end” of the memorial ride. However, we hope everyone will continue on, completing a wonderful ride of your own, keeping John and Debra in your hearts. To remember, and to make a difference. The families of John and Debra both wish that the ride serve to elevate the profile of cyclists in the eyes and minds of drivers, too many of whom are not aware of the our rights on the road, do not expect to see us on the road, and pass too closely when we ride to the right. With this in mind please stay visible on Pacific Coast Highway through Laguna Beach, especially on the part of the road where John was killed. Ideally, ride solo or no more than two abreast. If you can, please leave a gap of 15-20 seconds between riders. We do not anticipate stopping at the place of John’s death; with no bike lane and a narrow shoulder, there is just no safe place for any size group to stop. Instead, you may request a single flower at the start of the ride to drop along the road – at that location or anywhere you choose. Please consider riding to the start of the ride. But for those driving to the start, there is likely to be available street parking in downtown Laguna Beach or at Heisler Park. 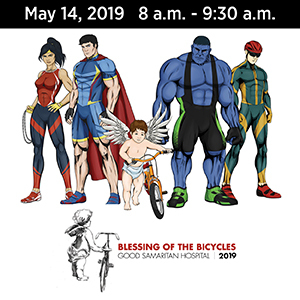 Another option is to park at the Newport Coast Community Center (6401 San Joaquin Hills Rd, Newport Coast, CA 92657), at the top of Newport Coast Drive up hill from the official ride will end, and bike down to the start from there. To no one’s surprise, the family of fallen cyclist Milt Olin plans to file suit against the LA County Sheriff’s Department today. The toll taken on leading riders in this year’s Tour de France serves as a reminder of the human side of the race. Turns out it was a pothole and an energy bar that took down Alberto Contador. And after two crashes in two days, American favorite Andrew Talansky drops more than 10 minutes behind the leaders, while Ted King writes what it’s like to crash out after the 10th stage. Streetsblog’s Joe Linton talks with new CICLE director Vanessa Gray; sounds like the group is in good hands. More on today’s showdown over the missing bike and pedestrian funding in Metro’s short-range plans. USC’s Neon Tommy looks at the Bike Oven. A Burbank letter writer says safety efforts on the Chandler bike path are wasted when cyclists and pedestrians are still at risk on the streets. San Diego’s 10 News reports on the proposed law to create Amber Alert-style notices for hit-and-runs. 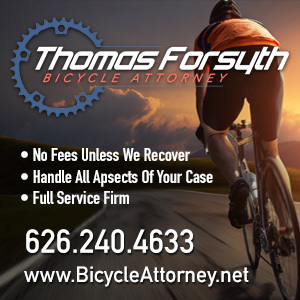 Kill a cyclist in Napa County, get off with probation and community service. Outside Magazine looks at post-doping-ban Levi Leipheimer, and the future of an entire drug-tainted generation of riders. A new IndieGoGo project is raising funds for a new website to report on women’s pro bike racing. New bike manufacturer Priority promises a three-speed, maintenance-free belt-drive commuter for under $400. Indiana TV station attaches a camera to cyclists’ bikes, and catches motorists driving safely. Boston Red Sox fans get a free bike valet at Fenway Park. A collision with another rider — and an Icelandic volcano — change a Vancouver cyclist’s life in an instant. The Guardian rides Team Sky’s £12,000 — or $20,500 — Pinarello Dogma F8. And likes it. Someone pushed a Welsh cyclist into a ditch as he stopped to fix a flat, and stole his Pinarella Dogma before he could get back up. But his was only worth a measly £3,000. Any city can have a Bike to Work Day, but how many can Tube to Work? 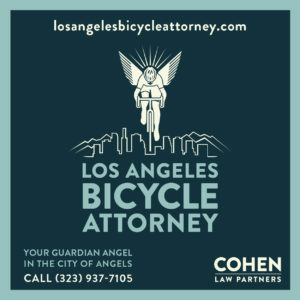 Thanks to Todd Rowell for his generous donation to support BikinginLA. 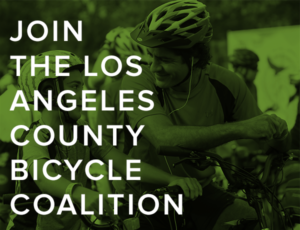 Click here to contribute or advertise, and help keep SoCal’s best source for bike news and advocacy coming to you every day. Sometimes, the SoCal cycling community awes me. For the past few weeks, Newport Beach cyclists have been planning a memorial ride and fundraiser to honor fallen riders Sarah Leaf and Dr. Catherine “Kit” Campion-Ritz, both killed the same horrible weekend last month. As well as a third woman, Betty Bustrum, who somehow survived a serious collision on the Coast Highway. When they first started planning this ride, I think organizers would have been happy if a few hundred riders showed up. Let alone the 600 bicyclists who had signed up to participate as of Saturday night. Then the morning dawned, and over 1,200 cyclists were waiting at the starting point to honor the dead and injured, and call for better safety on Orange County streets. I say over 1,200, because that’s when Newport Beach police stopped counting. It could have been 1,300. Or 1,500. More than 1,200 riders whose hearts — amazingly big, caring hearts — were in exactly the right place. And who have contributed $53,000 and counting to improve bike safety in Newport Beach, with the city pledging to match donations on a three-to-one basis. Which means that $53,000 is really worth $159,000. It came in the form of t-shirt sales, wristbands and donations ranging from a single dollar to $10,000 donated by our friend Frank Peters of cdmCyclist. And there’s still time to raise more, as donations will continue to be accepted through the end of this year, in case you happen to find your heart and wallet full at the same time. I don’t know if any of those riders were there because of anything I wrote about it here. Or if a solitary dime was donated due to anything I may have written. But it doesn’t matter one whit. I am simply amazed and gratified so many cyclists gave up their Sunday morning for their fellow riders. And thankful for April Morris, Joan Littauer, the Orange County Bicycle Coalition, and all the people who volunteered their efforts and gave up far more than one morning to pull this off. As long as we’re talking memorial rides, the stepdaughters of fallen cyclist Benjamin Torres are hosting a BikeRun in honor of their stepfather on Saturday, November 10th. If you live or ride in the Gardena area, show up to show the world he hasn’t been forgotten. And that all bicyclists have the right to ride safely. A bicyclist is seriously injured, and a motorcyclist left in critical condition following a crash on Santiago Canyon Road near Modjeska Grade Road. Rancho Santa Margarita Patch quotes an OC Sheriff’s Department spokesperson as saying the collision was severe enough that they initially thought it was going to be a double fatality. But evidently, the OC Register was more concerned with the effect the crash had on traffic conditions. Redlands police are looking for a hit-and-run driver who ran down a cyclist from behind at 45 – 55 mph, leaving her with critical injuries. The victim is identified only as a black woman in her 30s or 40s; police are looking for a newer black mid-size, 4-door sedan with tinted windows, and damage to the front bumper, windshield and roof. The first NACTO conference reveals cities around the country are making their own transportation improvements without state or federal help. New York’s pro-cycling Mayor Bloomberg declares bicyclists, pedestrians and bus riders are as important, if not more, than motorists; thanks to Michele Bigelow for the heads-up. And NY stats show a 49% increase in retail sales along one new bikeway, and a 49% reduction in commercial vacancies along another. So much for bike lanes being bad for business. Unbelievably, after all the lies in pro cycling’s recent doping scandal, UCI picks Pinocchio as the mascot for next year’s World Championships. Talk about tone deaf. Meanwhile, pro cycling’s governing body faces an investigation into its role in l’affaire Lance. The Guardian says UCI has a long way to go to reclaim their credibility, while five Euro newspapers team up to provide a roadmap to recovery. Richard Risemberg offers solutions to the disappearing eastbound bike lane on Santa Monica Blvd in Century City; the current solution is pedal fast and hope for the best. Santa Monica’s Bike Center encourages new cyclists by loaning them a free bike for two weeks. A Downey writer calls on the city to develop an effective bike plan. Chico’s new city manager gets to know the town on two wheels. A pair of Napa cyclists look back on the recent Furnace Creek ultra-distance bike race. It’s been a bad month for bike shop employees, as two were killed while riding this month. A red light-running New Mexico driver gets a whopping 90 days of home detention for killing a cyclist; way to crack down on dangerous drivers, your honor. A writer in my hometown asks if helmets are necessary in a cycling city. The mayor of Fort Worth conducts her town halls on two wheels. There’s a bicycling renaissance in central Massachusetts. It took a group of NY non-journalists to do the work the press didn’t and help bring doping to light. A cyclist is being sought by Vancouver authorities for beating another rider, apparently for riding the wrong way on a bikeway. London plans to open the South Bank of the Thames to cyclists and pedestrians. A UK driver gets off with a slap on the wrist after the victim is blamed for his own fractured skull because he wasn’t wearing a helmet; so if I shoot someone, it’s his fault for not wearing a bulletproof vest, right? A British town is up in arms over the presence of a recumbent rider. In a truly heartbreaking case, a British rider is hit and killed by a car while exchanging information with a driver hit him in another collision moments earlier — and to top it off, his bike was stolen following the first collision by two men offering to help. The New York Times reveals why nearly forgotten cyclist Fiorenzo Magni was one of the greatest riders of his era — and not just because he finished 2nd in his final Giro with a broken collarbone and a broken arm. Four months after nearly getting killed in a Santa Rosa hit-and-run, Kiwi pro Michael Torckler makes a near-miraculous recovery to ride competitively once again. Finally, I know the feeling, but seriously, don’t hit the car back after it hits you. If you’re going to carry your five-year old son on your bike, leave your portable meth lab at home. And don’t get too comfortable, you can be replaced.